Have you had someone observe your students learning in your classroom? If yes have you been able to use this information to plan some professional improvement goals for the remainder of 2014 and into 2015? If no then when do you plan to invite someone into your class to observe your students learning? Have you invited feedback from your students about your teaching? If no then when do you plan to invite your students to provide feedback to you based on your teaching? John Hattie tells us the most important factor in student learning (outside of the student themselves) is the teacher. Dylan Wiliam also believes “every teacher needs to get better”, not just those that are seen as struggling but every teacher. Of all the things we have to do, and there are many, helping students to learn is at the centre of our professional responsibilities. It therefore stands to reason that improving our ability to do this is also at the centre of our professional lives. We all attend T & D but how often does traditional T & D support us to drill down and examine our practice at the coal face, in the classroom? If we only ever attend traditional T & D and rarely have our classroom practice analysed then I am suggesting that our T & D is going to be less effective than it could be. No doubt we need to attend conferences, develop networks, share ideas and keep up to date with the latest educational information and traditional T & D can do this. However all the great conferences in the world mean nothing if we choose not to find the time to change our classroom practice for the better. A conference may help us identify aspects of pedagogy that we need to improve but the disconnect between the conference and classroom is often too great with all our enthusiasm dissipating by the time we return to the real world. Conferences also struggle to identify our pedagogical blind-spots. There are certain things that we cannot identify in our own teaching without the assistance of observation by our peers, students or video. The idea that “We don’t know what we don’t know” (blindspots) is a key reason why we need to have others provide feedback on our teaching. This is not to say that traditional T & D can’t change practice for the better, I am just suggesting that classroom observations and student feedback provide a different lens for us to view our teaching by. In a supportive and committed environment were all staff help each other to develop their practice this lens can be a valuable learning tool. So how might this all look? How do I get started, if I haven’t already? What do I do with all the feedback I get? To be reminded about the PBAS observation process click here for a post I did in early September. To help demonstrate the practical application of using classroom observation and student feedback I would like to share my use of student feedback and classroom observation and how they have helped me to develop some learning goals for the remainder of 2014 moving into 2015. Student feedback – TfEL Compass survey tool. Domain 2 Create safe conditions for rigorous learning. Student feedback – TfEL Compass survey tool. Domain 3 Develop expert learners. Time is often a reason for not getting to things. If we can aim to gather information over time rather than think that it all needs to be done now we will be much more likely to maintain a process that provides regular (term by term) feedback. I have estimated that over the first 30 weeks of the year I have spent approximately 2.5 – 3.5 hours in total organising, collecting and analysing feedback on my teaching. Below is what I have taken from my feedback to work on over the next 6-12 months. 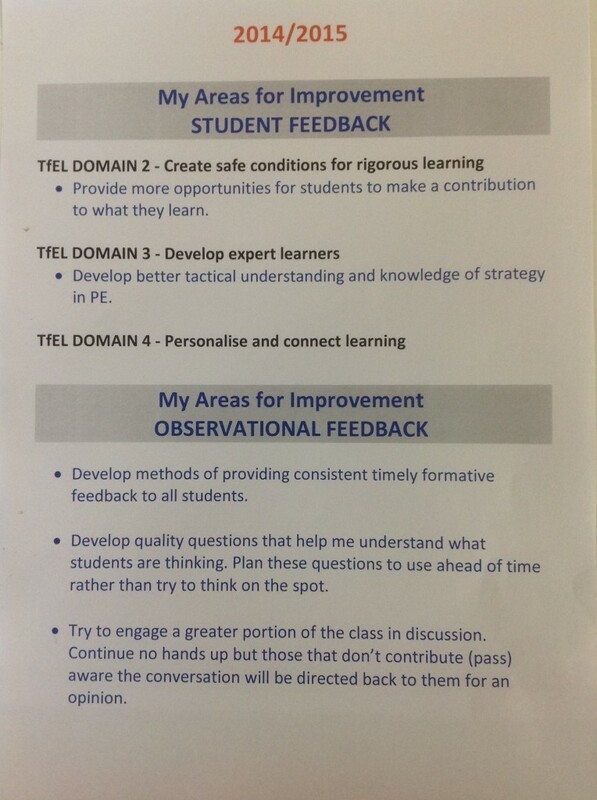 I still have the TfEL Domain 4 student feedback survey to complete in term 4. I intend to try and complete one thing per term for terms 2, 3 and 4 in 2015 that is around classroom observation and student feedback. I want to leave term 1 2015 free to try and continue to develop what I have already identified below. Will I get to focus much on these things in term 1 2015? It is a big term for me with sports day, inter school sports day and SANTOS athletics. Are there too many things to work on in the document below? Will future feedback change my direction? How will I go about improving in these areas? Where/how can I access support to get better? 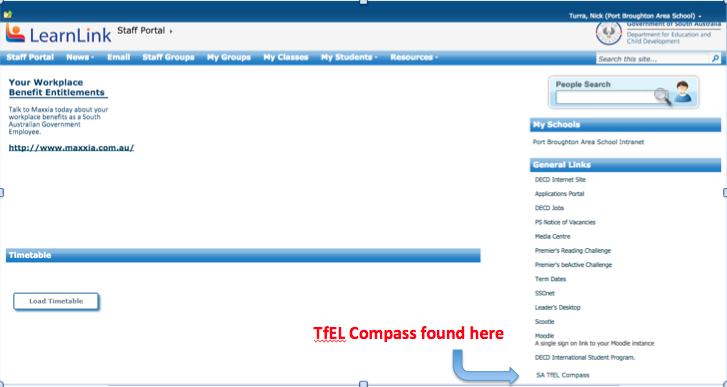 Access the TfEL Compass tool via the LearnLink staff portal. For me, this quote (a modified Robert John Meehan quote) sums up what our attitude towards professional learning should be. This entry was posted in Classroom Observations, Pedagogy, Professional Learning and tagged Dylan Wiliam, John Hattie, pedagogy, professional learning. A great link shared with me by Joelene to a post about what its like to be a student for two days. Read how it opened a teachers eyes and what they would change because of it. Getting feedback from students no matter how we do it can be important. I remember at some previous high-schools we’d do two double-lessons for a subject each week rather than four/five singles. I found this worked quite well in terms of giving students time to stretch/rest between lessons without interrupting too much learning time. It also allows for larger hands-on activities that require more than 50mins. Could that be implemented? I have invited a huge amount of student input as to what the course will look like this term and I think we need to develop the skills our students have to provide more useful information. I ended up hearing they don’t like reading, writing or listening to me. To a lesser extent the same could be said for peer observation and I know I was a bit rusty articulating my craft to a student teacher last term. To that end the DECD Teacher Observation Tool (http://www.decd.sa.gov.au/hrdevelopment/files/links/DECD_ObservationTool_A_1.pdf) is a fairly helpful document in terms of up skilling the observer. I am really keen to have a focus on building dynamic groups of students in my classroom this term and am still wondering what this might look like. Part of that will be building on their peer assessment skills, which was a disaster for me in Term 3. Any suggestions would be most appreciated and if you have any skills around group work please come and observe. How did you collect your feedback Wardy? It is one of the strengths of the Compass tool that the questions are designed to elicit feedback on key pedagogical strategies. 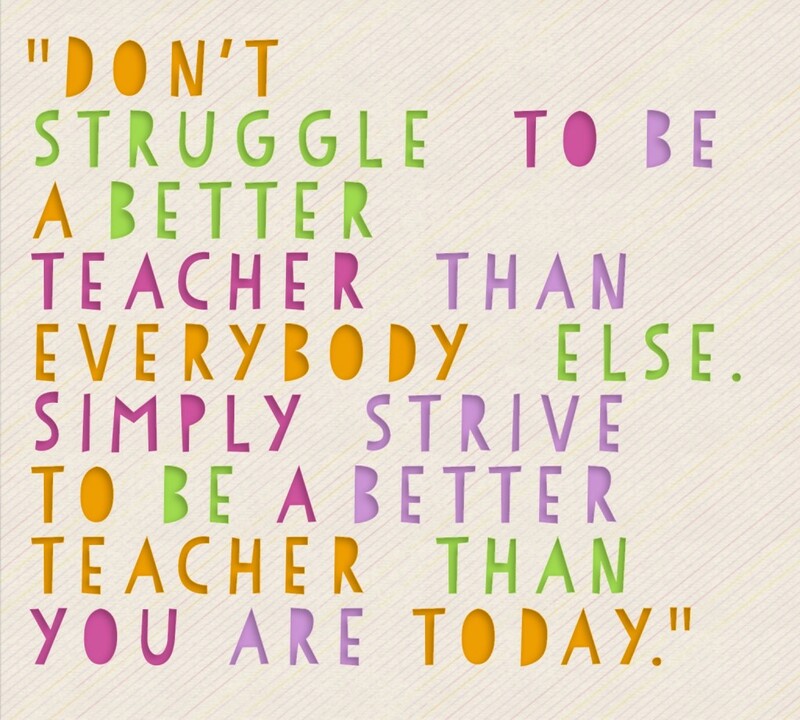 You are absolutely right about developing our students skills, showing them and talking to them about how to help us. The quality of the questions we ask students are important if we want useful feedback. The way we ask is important. The reason why we we ask is important and should be explained to students. Showing students we take their feedback seriously by showing them we will and are using it is important. It is not as simple as saying here is a survey about my teaching and nothing else. I have tried a whole heap of student feedback tools previously but to be honest I settled on frequent but short anonymous Edmodo quizzes and just plain old asking students individually. I think frequency, not depth is the key. I agree I probably need to think about how I can make my questions more sophisticated. Considering formative assessment – I am conscious of the verbal feedback given by the class and its members, including the feedback given that is at times rude and unwelcome, from the mouths of babes. Students frequently share their feelings on any given subject, informed or not. Students will often attempt to negotiate tasks or suggest alternatives. This generally requires of me to sift through the ignorant and lazy input. Yet underlying much of what the students share can be found some interesting food for thought. I attempt to act on the information shared; however the constraints of time, curriculum, policy etc. often prevent me from being able to deliver with serious impact, to meet the needs of the students and maintain their engagement and understandings. Matthew the feedback you are talking about seems to be unsolicited and informal/unstructured in nature. If you use a more formal tool like the Compass tool or survey monkey and explain the purpose of the information and the seriousness of the process students will generally respond in kind. Sometimes it can be hard to determine what feedback to act on and as you said time constraints hamper this process. However it is important that we listen to the student feedback and select one aspect to focus on. Once you have this one focus talk with your class let them know that this is something you want to improve and it is as a result of their feedback. Students will (hopefully) see this as an acknowledgement of their opinions which could be very powerful. Acknowledging students feedback publicly (in class) and showing students that I am using it is my next step. Jackie and I spent an hour starting to develop a suitable survey (with Nick’s help) using the Compass Tool. In the end we decided (good idea Jackie) to survey our classes this term using the activote egg system on our whiteboards. We have been using this more frequently over the course of the year to gauge student progress and understanding of concepts. In 2015 we will use the Compass Tool and then we will compare which one worked best for us. 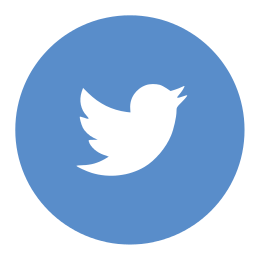 A potential issue is the lack of being able to write a comment using the voting eggs – most seem to find this feedback from students to be the most beneficial. Check with us if you would like to see how the “eggs” work. Would be great if you could share how you found this process once you have done the survey with the kids. For example: What was the feedback like? What would you change next time? How did the students approach the process? Would you continue using the voting eggs? Were the questions appropriate (assumed you used TFEL Compass questions)? I think its great that you and Jackie have shared your work on here. Hopefully helpful to others. Just thought I would add that I had my class complete their feedback for me today in our class meeting time. An advantage of using the activote eggs was we could read out each question so those who find reading challenging were able to complete this survey honestly. In fact, it was a student who requested that I read out the questions for everyone. All students present were able to complete the survey at the one time and we didn’t need to go to the computer suite. A disadvantage of the voting eggs was student weren’t able to make any comments. At the end of the survey I gave students the opportunity to write any comments they might have and they handed them up. I am happy to say that one of my year 4 students provided excellent feedback as in that I should have asked two more questions. 1. Do we get the opportunity to read information in front of the class enough? 2 Do we get asked to come up to the board to share our ideas? I will add these to questions to my next survey. (There was other feedback as well). The experience was less daunting than I expected. Thanks to Paul and Nick for their support. I certainly have some things to ponder and examing student responses will assist me select future goals and gives me their ideas on things I can improve in. Sounds great Jackie. I hope that you got some benefits out of the process and the fact that you found it “less daunting than expected” is a real positive. I am looking forward to how you refine this and how often you will use it each year. I love the two suggestions by the student about what sort of questions you can include in your next survey. This demonstrates some real engagement in the process.